This Mother’s Day, get mom out of the kitchen so she can actually enjoy her day! Melitta has some delicious coffee that is also ORGANIC that is sure to make your mom really happy this Mother's Day! Melitta’s gourmet, extra fine grind coffee is made from the world’s best beans – high-grown Arabica beans – and is available in delicious medium and dark roasts, a decaf roast, a unique blend of dark and light roasts, three flavored coffees and an espresso roast. Melitta® Fair Trade Organic Coffees reserve the finest quality for those who prefer the most natural coffee our earth can produce. In the world's best coffee producing regions, there remain a select number of farmers that have grown coffee the same way for generations. They plant and nurture each coffee tree using only environmentally friendly techniques. They harvest each crop by hand. The coffee from these farms is 100% organic and the flavor is pure...the way nature intended it to be. Melitta uses only these premium quality high-grown Arabica organic coffee beans in their entire line of Fair Trade Organic Coffees. Created with nature's harmony and balance in mind, their organic coffees are the natural way to enjoy premium flavor and indulgence. By choosing this Fair Trade Certified™ product, you are directly supporting a better life for farming families through fair prices, direct trade, community development, and environmental stewardship. Make your mom VERY happy this Mother's day with a nice, hot cup of Melitta Fair Trade Organic Coffee! You can purchase the Melitta Fair Trade Organic Coffees for $7.99 each from the Melitta website. 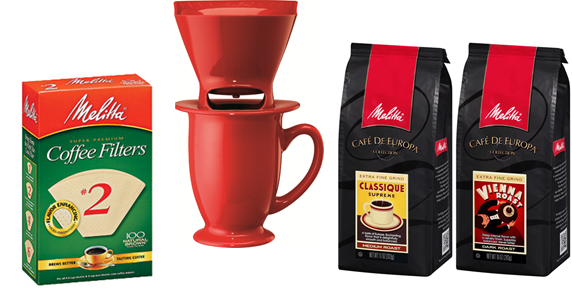 Melitta is generously offering (1) Coffee Prize Pack including 2 bags of coffee, a box of filters and a pour-over coffee maker to a lucky winner!